3. Scott Sillcox, sports uniform historian, owner and founder of Maple Leaf Productions and Heritage Sports Art. My name is Scott Sillcox and for 15+ years I owned Maple Leaf Productions. We were a licensee of the NFL, MLB, NHL and through a partner company, the NCAA, and we created and sold a number of products, the most famous of which were our horizontal posters. The Lions’ poster showed the evolution of the team uniform from the early days to the modern era – click here to see the poster or see the poster below. Our other products – all of which celebrated the history of team uniforms - included fridge magnets, clocks, playing cards and FanFrames. If you are a huge Lions fan, you might be interested to know that the 16 pieces of original artwork used to create the Lions’ poster shown above – the actual hand-painted watercolor paintings – are available for sale at Heritage Sports Art. 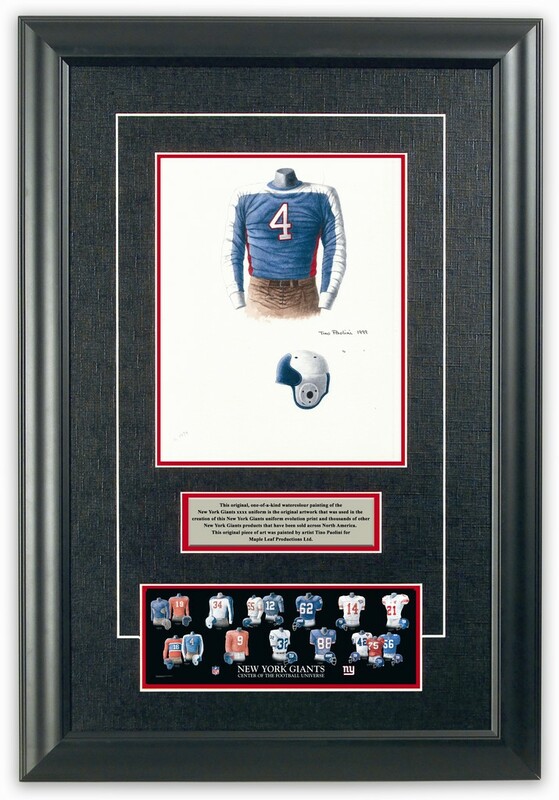 When you watch this NFL Films video, you will see 4 of the 16 actual painted uniforms – and you can actually own that original artwork – how cool is that! 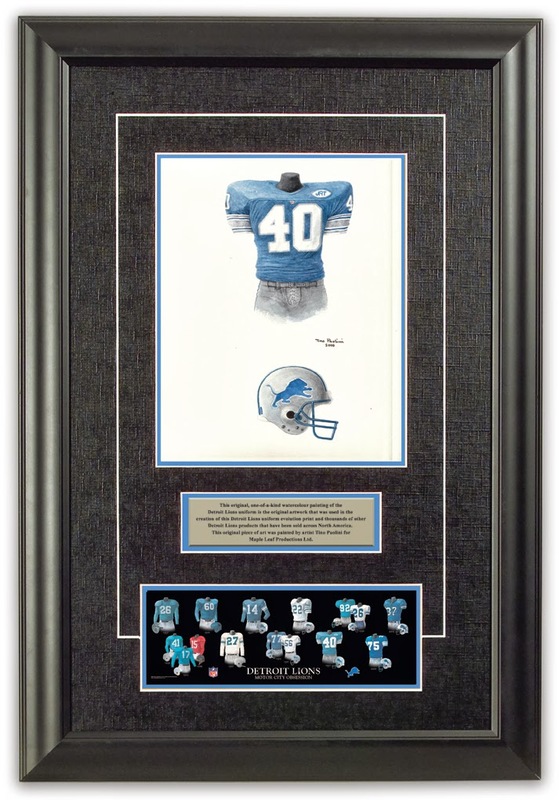 Please note: Some of the 16 pieces of original Lions uniform artwork may have already been sold to other avid Lions fans, so you may want to act quickly if you would like to own what we lovingly, and honestly, call a “somewhat famous” piece of art. 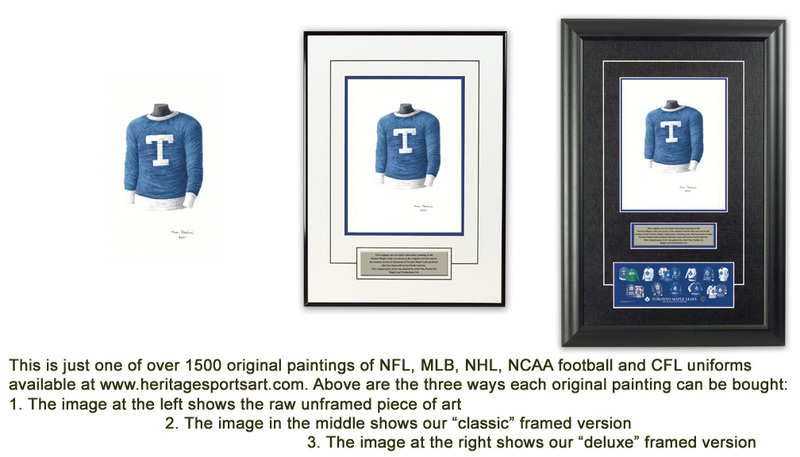 A lot of sports art is terrific, as is our art, but not many pieces of sports art have been reproduced thousands of times and can be found hanging in people’s homes and offices across North America – to me that’s what makes buying and owning this original art so cool. Each piece of original artwork is beautifully framed in a tasteful and attractive way, and the engraved plate contained within the framed piece tells the story of that particular piece of original art and how it has been reproduced in thousands of posters and other products sold across North America. These framed pieces make a great gift – birthday gift, anniversary gift, retirement gift - and considering that you are buying original artwork that is also somewhat famous with a fun story behind it, they really are very reasonably priced. Here is what a framed piece looks like. 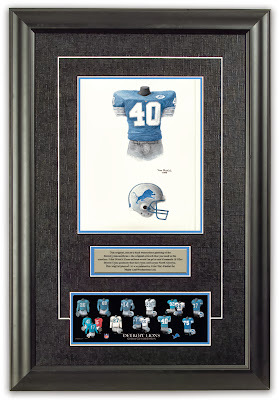 Click here to see what all 16 of the framed Lions pieces look like. You can also purchase the framed originals from this same site. Thanks for reading this post and enjoy the video! PS The video can also be seen here - just scroll down and then click on the Lions logo to see the video. Or you can also go directly to this NFL site to view the same video. Detroit Lions and their colorful uniform history very nice video and awesome blog you provide for the uniforms history lovers.Keep Blogging. Sometimes it's weird to see all of these jersey changes through the years but at the same time you also learn so much of its history and what they have gone through to get to this point. It's amazing! I csnt the patriots have never worn the silver shits with the silver pants. I hate those blue pants and the design on the sides of both home and away shirts. I like throwback Detroit Lions jersey.